What do you do with those odd socks that everyone inevitably winds up with? Do you throw them away? Or maybe use them to dust the furniture or wax the car? Sometimes you might even pick two out of the pile and wear them even though they don’t match. There are some excellent old sock craft ideas that will give you some great ways to use up those odd socks. Why not try a couple and see how creative you can get? 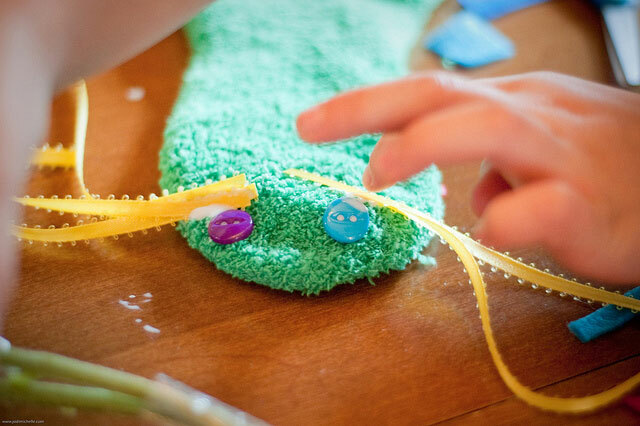 Sock Puppets: Sock puppets are easy sock crafts for kids and adults to make together. All that is required is an old sock or two, some decorations, and your imagination. Kids can use markers and paints or buttons and beads to create their own individual sock puppets. Googly eyes and yarn hair will give your puppets character. The entire family can get involved, and when all of your puppets are made, you can host a puppet show. Encourage writing skills by having the family work together to write a story about their sock puppets. Homemade Hacky Sack: If you are looking for a fun and easy sock craft, make a Hacky Sack. Your kids may not know what that is, but chances are good that you do. All you need to do is cut off the top part of an old sock, fill the bottom with beans or beads, and sew the opening closed. Make sure to sew it into the shape of a ball. Now you are ready to teach your kids a new talent. Show them how cool you used to be! Sock Jump Rope: A sock jump rope is a great way to turn a pile of odd socks into an odd sock craft that the whole family can use. Jumping rope is great exercise for all ages. Knot about 15 old socks together (the number will depend on the size of the jumper) and start jumping. Make a Can Cozy: Can, bottle, and even coffee cup covers are a snap to make out of old socks. This is an easy sock craft that is fun for summer cookouts or trips to camp. White socks work great. Let the kids use markers to decorate their own can cozy. If you are the adventurous sort and don’t mind a mess, tie-dyeing the socks can be a lot of fun. You can cut the sock to size or just fold it to fit the bottle or can you are covering. Sock Quilt: The old sock craft ideas mentioned above are quick and simple suggestions. But if you are a crafter looking for a bigger, better odd sock craft, why not try a quilt? Baby socks can make an adorable welcome-to-the-world gift for a newborn. A bag of mismatched socks can easily become a quilt that will be used and enjoyed for years. It would certainly be a great conversation-starter. The Sock Monkey: This quintessential childhood favorite was originally created by hand, prior to being manufactured and marketed. For a more personal touch, make an original sock monkey for a child or adult in your life. There are many sock monkey instructions out there to help you through the process.